The two Pulga Bridges are far enough upstream across the North Fork of the Feather River to not have been impacted by the construction of the Oroville Dam. 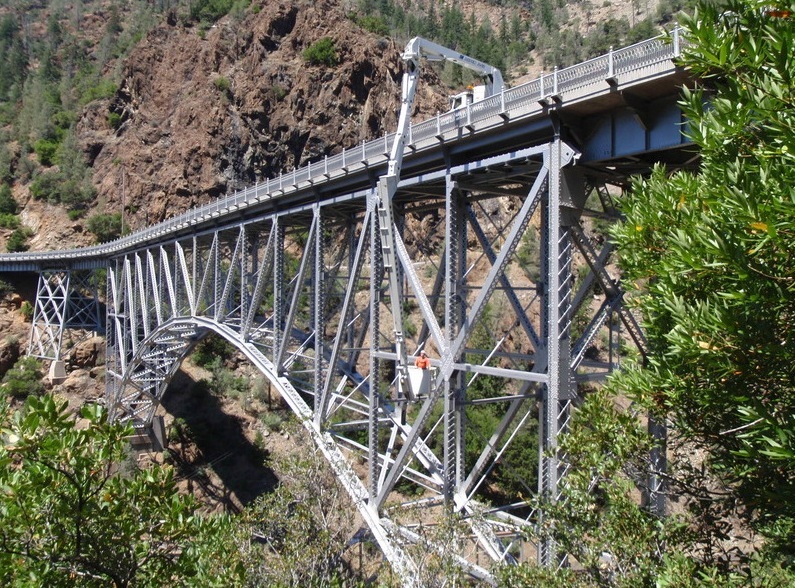 The taller bridge is a truss arch that was built in 1932 and got some repairs and a seismic retrofit in 2002. It carries State Route 70 over the river and over the Western Pacific (now Union Pacific) Railroad Bridge 170 ft below. 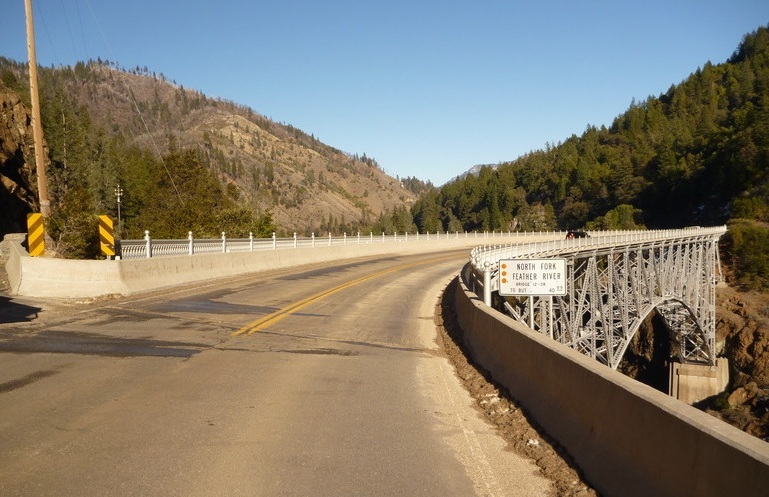 This portion of State Route 70 was established as the 'Feather River Scenic Byway' by the USDA Forest Service and includes about 130 miles of road carved out of the Feather River Gorge through the Sierra Nevada. The photo above was taken in 1937 just after the new highway was completed (courtesy of the UC Davis 'Eastman's Originals Collection') . It looks very similar to the photo I took 78 years later. The bridges were named after the nearby town of Pulga (Spanish for flea) which was also called Big Bar. 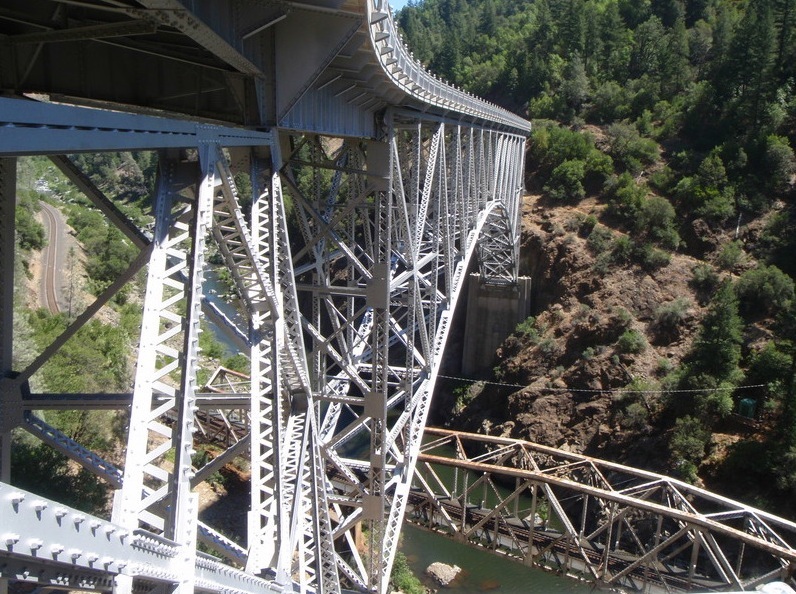 The railway crossing is a 435 ft long three span through truss bridge on concrete piers. 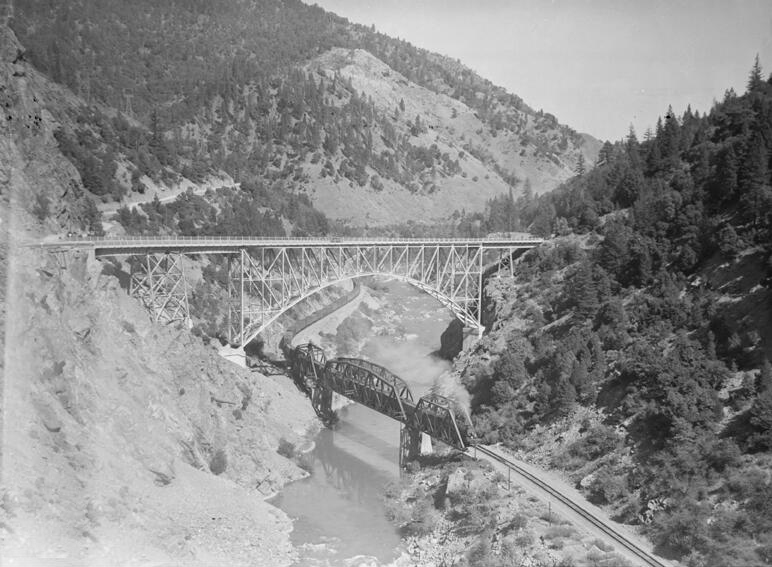 The bridge was built at this location so the grade could be maintained at 1.0 percent all the way to Beckwourth Pass near Nevada. The railway line was completed in 1909 and it's only half as steep as Southern Pacific's Donner Pass Line to the south. The highway crossing (12 0038) has a 350 ft long main span and a 684 ft long total length. The approach spans are steel girders on steel towers and the main span is a truss arch on concrete piers. Large 'deadmen' supported the ends of the arch while it was assembled. It took 3 1/2 years to build. The bridge deck is on reverse horizontal curves and it also has a twisting superelevation (see photo above). My friend Steve designed the retrofit/repairs. He said there weren't any shop drawings so he had to measure everything on the bridge (especially all the gusset plates). They built a timber walkway on one side of the bridge so they could work on the retrofit/repairs. 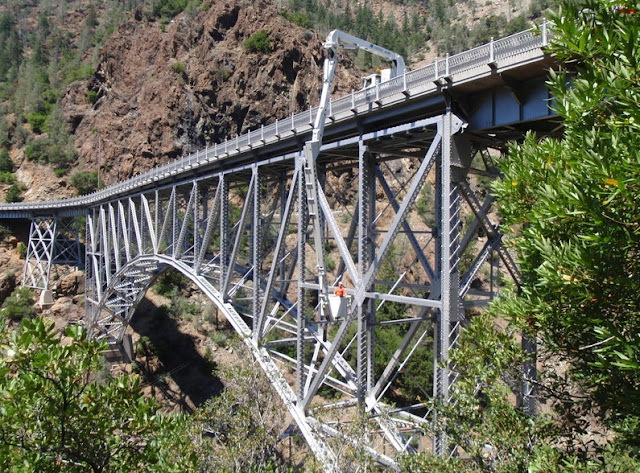 Rope climbing teams used to do the biannual bridge inspection but now they use a snooper truck instead (see photo above). Butte County, California Bridges: Pulga Bridges over the North Fork of the Feather River by Mark Yashinsky is licensed under a Creative Commons Attribution-NonCommercial-NoDerivatives 4.0 International License.